Hello ... Hello ... my old friends ... It's great to see you once again! 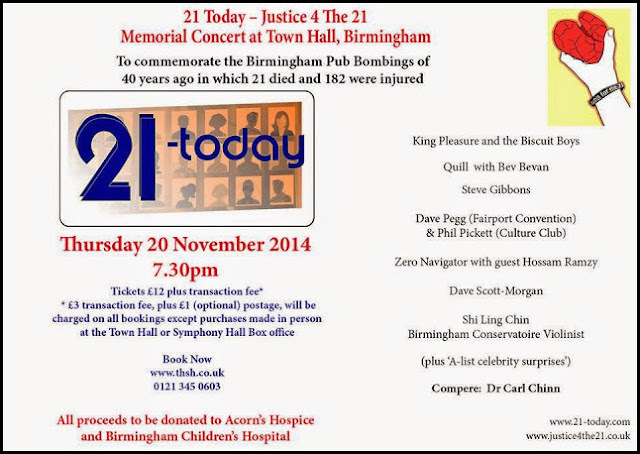 A very special concert has just been announced in memory of the 21 victims of the Birmingham pub bombings on Thursday 21st November 1974. 21 TODAY: JUSTICE 4 THE 21 has been organised by campaign group Justice 4 The 21 and will be held on the eve of the 40th anniversary of the outrage on Thursday 20th November at Birmingham Town Hall. Steve Gibbons, Quill, Phil Hatton, former ELO members Dave Scott-Morgan and Martin Smith, Dave Pegg [Fairport Convention], Zero Navigator [featuring author R J Ellory], King Pleasure and the Biscuit Boys [amongst not a few others] plus classical musicians from Birmingham Conservatoire will perform during the event, which will be by respected Midlands historian Professor Carl Chinn. ELO Beatles Forever [ELOBF] continues to endorse Justice 4 The 21 and recommends the 21 Today event on Thursday 20th November to those enlightened folks who enjoy the music of ELO, Jeff Lynne, Roy Wood, The Move, The Idle Race, 'Brum Beat', The Beatles and related artistes. For further information, please visit the J4T21 official web site.